New rider Brendan Schiemer has taken Vets racing by storm taking out his second victory in his first two races. Last week he belted a handy B Grade field in the crits and this week he backed up with another strong victory in a handicap race at Dunnstown. A big field turned out in great conditions for a 66 km race around an old vets track at Dunnstown. In fact it was a meeting at the Dunnstown pub in late 1989 the original Ballarat Vets was formed under the guidance of Richard Marnell. So with a big field and some form riders it was on from the start. First away was John Faulkner, Ray Hodgson, and Lisa Ritchie off with a 26 minute advantage over the three scratchies. The two boys from Bacchus Marsh on a comeback ride and Lisa astride a brand new steed. They made good progress when Faulkner suggested that Lisa should strike out for victory alone. Next bunch away was Terry Collie, the General Graeme Parker, the chirpy Mal Rock and the improving Tony Herbert. Terry collie was found wanting after a lap but the others battled on with Mal Rock the strongest. Tony Herbert performed admirably until lap two and then left the other two to go for it. Chasing this bunch was a collection of goers, led by Flyin’ Brian Lee. He was backed up by his brother Kevin, Bob Morley, Matt Ritchie, Brad Eppingstall, and Robert Parker. They were not expecting to hold of the bunch of 10 behind them and their job was made more difficult when Bob Morley punctured early. All the action was at the back of the field where a small trio of scratchies were chasing a massive group of 10 off second scratch. 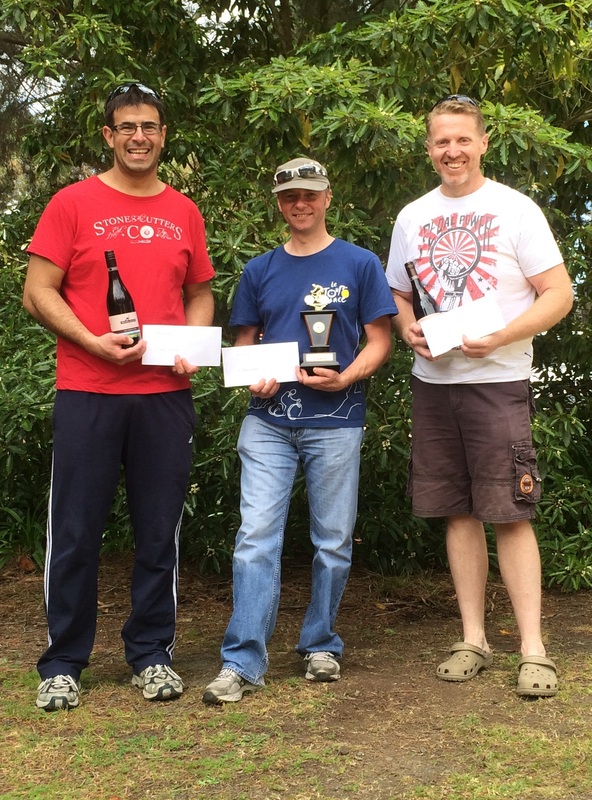 It was all or nothing for Tony Mirabella, Phil Cartledge and Andrew Rushton. Cartledge got on the front and committed to giving a huge turn to make ground early. This was good in theory but it buried the current club champion Andrew Rushton and he was spat out the back. This left Cartledge with an edge off him and left Mirabella with a choice. He chose and jumped clear to bridge the minute gap by himself. Surely not possible! But he dug in and inch by inch he pegged them back risking blowing up in the attempt. The one minute bunch faltered at the T intersection because of roadworks and that was all Mirabella needed to bridge. This formed the basis of a marauding group that cut a swathe through the group in front. And what a bunch it was. Heaving with talent with a mixture of regulars and new riders. Charlie Stebbing, a veteran from way back, slotted into the bunch effortlessly adding valuable experience. Others in the bunch included Grant Dawson, eventual winner, Brendan Schiemer, power house riders in Dean Wells, Grant Dawson, Richard Taylor and Michael Veal. Also lithesome trio of Shane Butler and Jonathon Lacey and Matt Turner. They rounded up the bunch in front and Mirabella lifted the pace up the hill before the left turn toward Dunnstown. Veal, Ritchie, Parker, Kev Lee, all felt the blowtorch that was applied and the super group charged on. Only Brian Lee survived. It was only a matter of time ‘til they rounded up the bunches in front, and Lisa, on the new bike, was the last to be caught in Ti Tree road and discarded. The group was now up and it was down to strength and ad tactics. Coming into Navigators saw the pace settle. Dean Wells jumped not far past Yankee flat Road but was quickly covered by Stebbing and the eventual winner in Schiemer. Stebbing then went to the front with Brendan second wheel. Schiemer jumped clear into the corner und up the small ascent over the bridge and it was on. They were all watching the lone scratch rider Mirabella to take charge but he was happy to settle for second and fastest. Schiemer was well clear and went over the line with severe cramps to take a notable victory. 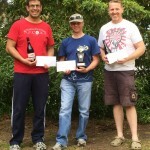 Third was Jonathon Lacey, fourth was Shane Butler, and fifth was Dean Wells. A great race with great individual performances. The Open season for riders is finally over and club racing returned to Ballarat, a small field and only 2½ races contested. Only two riders, Tony and Dean, so they sat on the back of B Grade in a ‘coaching’ role before a one lap sprint for the win. No question about the winner, Tony out-gunning a competitive Dean. Bob Morley bought his neighbour, Brendan Schiemer, along for a try-out with Eureka Vets. He was welcomed into B Grade to see how he’d go. “Good bloke”, remarks Bob. “Can go a bit”, said Bob. Well, he went very well indeed, easily accounting for the field in a devastating prolonged break with Rob Phillips. Nine riders started, plus the two A Grade ‘coaches’, who controlled the tempo for the first few laps from the front. Peter ‘Fifi’ Livitsanis and Rob Phillips were not impressed and started to break the tempo up with some sharpish turns out front. It’s when he’s out front, that you realise Rob has a drinking problem, not much of it actually gets in his mouth, most of it ends up showered over the bunch behind. About 15mins in, and Scott ‘Reduction Man’ Denno rails the corner into the back straight and puts the race in the gutter, he’s opened up about 15m on the field who are now scrambling for wheels. He’s shut down by the top of the straight but the attack has gapped Albie ‘Honolulu’ Govan and Matt Ritchie who had been yo-yoing off the back from the gun. With everyone gasping for air, Brendan counter-attacked. Only Rob Phillips saw it coming and jumped across to his back wheel. Now with the two strongest riders off the front and two others off the back, the five left had work to do. Dave ‘Pixie’ Peters, Richard ‘Robocop’ Taylor and Fifi set about working turns under the expert coaching of Tony Mirabella. This is not always easy for the tempestuous Pixie, who is inclined to take off whenever he feels like it. Robocop seemed to be cruising, having the time and breath to send cheerios to his small adoring fans. The increased workload put Reduction Man and the neighbourly Bob Morley in the hurt locker and they retired to the sidelines, but not before lapping Albie and Matt. The chasing trio had given away the intermediate sprint to the two caning it up the road, hoping that once contested they would sit up a bit. Rob was hoping this would be the case too, his eyes bulging and his mouth full of handlebar. But this was not apparently Brendan’s plan, he smashed the sprint, easily taking the win. Contesting the sprint also increases the gap to the chasers and, with the hammer staying down, the gap is extended. Into the final lap, Brendan still has gas left and attacks into the wind leaving the suffering Rob Phillips in his wake and cruises home ¾ of a lap in front of the chasers. Rob was well clear for second and Pixie triumphed over Fifi in the dash for third cash. Welcome to A Grade Mr Schiemer. A field of 6 lined up, consisting of Graeme Parker, Mal Rock (fresh from 104 kms on Saturday), Greg Curnow (fresh from whatever shift he is on this week), Tony Herbert, Terry Collie (fresh from four Opens in five weeks) and Barry Robinson (lightly raced and just fresh). After a lap to allow Graeme to warm up, the group settled into a reasonably solid pace in the windy conditions. Tony Herbert must have just taken delivery of a new small chainring and was giving it a real workout trying to bed it in with some serious spinning. The windy conditions kept things in reasonable check until the bell for the first sprint when Greg gave himself a flick with the whip and dashed clear putting plan A into action – go for the first sprint then just stay off the front for the remainder of the race. Nothing complicated and, for a considerable period, effective. Of course you can imagine the conversation in the bunch – ‘leave him out there’ – which was easier said than done as Greg was keeping up a steady tempo. Eventually however the lack of any break in the effort took its toll and he was welcomed back into the fold. At about this point Tony Herbert had spun his legs out and departed company after a really solid workout and a great effort on the day. Fifty-five minutes dragged on to an hour and a half and still no sign of the bell. Terry’s legs were asking him ‘it must be this lap, surely?’ He responded with a ‘shut up legs’, with apologies to Jens. When the bell mercifully was rung there was one last effort from Terry and then he swung off turning into the back straight. Graeme, Mal and Barry were not keen to take the wind too hard so Terry was able to hang on the back all the time expecting the typical Greg flourish up the back straight but it never came. Mal led into the short straight and into the last corner, and with 104 in the legs and having ridden out the residual stiffness from Saturday, hung on for a good win from Graeme and Barry. Everyone satisfied with a solid workout. Michael Veal proved that it really is the size of the “big dog” in the fight that matters. With a howling tailwind he managed to get on top of a 55 tooth chain-ring in the final sprint to out gun the rest of the 8 minute bunch. A northerly wind strong enough to blow the spots of a Dalmatian ripped across the course and probably discouraged many riders from getting out of bed, but really if you don’t barrack for Hawthorn what are you still doing in bed? Today was a day for keeping the bunch together for as long as possible, individual heroics would be severely punished, but that didn’t stop some of the usual unconventional suspects putting in extraordinary surges and attacks. The 8min guys were the steamroller today, crushing everything. Michael “the Doc” Veal had been moved out 5min after a mediocre performance the week before and joined in-form powerhouse riders Scott Denno and Kevin Lee, new rider Matt Turner and the mercurial Bob Morley. With plenty of horsepower on board and working really well together they were always going to be in the final analysis. The new boy, Matt Turner was an asset, only missing a couple of turns but kept himself tight in the bunch. Popeye Lee is a monster, how a guy who never really gets in the sit never seems to be in trouble is a mystery. Bob’s training has stepped up in the last week and today he didn’t miss a turn, and finished off the race well. They rode down the 14min bunch of Greg Curnow, last week’s winner and scourge of Eastern Vets Mal Rock, Graeme Parker, Jude Jonasson, and Tidy Teeth Terry Collie in Donovan’s road at the end of lap 2. But the wind was a critical race factor today and the 8min monsters found it impossible to drop the 14 min limpets on the downwind stretch and impossible to drop them on in the northerly cross wind on Quarry hill road as there was plenty of road for a sit. Bob was keen to shed the sit-on sprinters from the 14 min group so he attacked half way up quarry hill opening a gap. Reduction man Denno then jumped and dragged the rest of the 8 min group back up to Bob and once they got around the corner the wind did the rest. But Tidy teeth Terry had somehow survived, he was tolerated in the group as he worked hard to sustain the group’s advantage and didn’t miss a turn in the run home. He also led most of the way up Donavan’s on the home stretch as well, recent Opens have definitely contributed to Terry’s form lift. Now with the race in their hands, 6 riders, 5 places in the money, it was just a matter of sorting out the order. With no sight of anything threatening from behind, the pace lifted anyway stringing them out in a line with Bob on the Doc’s wheel at the back waiting to pounce. The Doc backed it off and then unleashed the beast, he hit Reduction Man and the others at speed a long way out and held it easily to the line. Bob was hoping to hang onto second but Denno and new boy Matt got him about 50m out. Chasing this juggernaut was the 3min chopping block quartet. Dean Wells was in scintillating form and a minute or a couple of more in form riders would have had him on the podium today. As it was, he not only put in the most work, he was also the only one to hang onto Scratch as they came through at the race mid-point. He even led the Scratch bunch home – for such a great ride he was duly recognised as ROD. Scratch pairing of Tony Mirabella and Phil Cartledge had a late surprise with the arrival of Andrew “Sparky” Rushton. As a pair they had little hope of catching the race today but as a trio it was game on. All three rode well, sharing the work around and only Tony’s late antics disturbed the discipline. In the end there was only 1.5min in it but the trio had settled for a sprint for fastest. With Dean taking Phil’s usual position leading out the final sprint, today could have been interesting, but Tony again proved he’s the fastest cat in the kindle, sprinting clear of the other two.